The Flyswatter2 is an high performance USB to JTAG in-circuit debugger and programmer designed for use with ARM and MIPS target devices. It uses the open source OpenOCD (Open On-Chip Debugger) software to provide debugging and in-system programming of embedded target devices. The Flyswatter provides a standard ARM-compatible 20-pin JTAG interface. 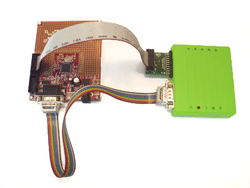 The JTAG interface connects to the target device with a 20-pin ribbon cable. This connection enables access to the on-chip debug module which is integrated into the ARM CPU. 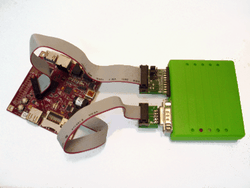 The debug module enables a programmer to debug the software on an embedded target system. 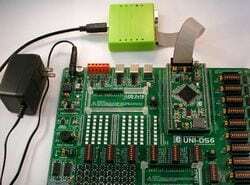 The second purpose of the JTAG interface is to allow the programming of NOR and NAND FLASH memory devices that are connected to or embedded within the target CPU. The Flyswatter2’s serial port provides you with an independent functional “USB to RS-232” serial device. 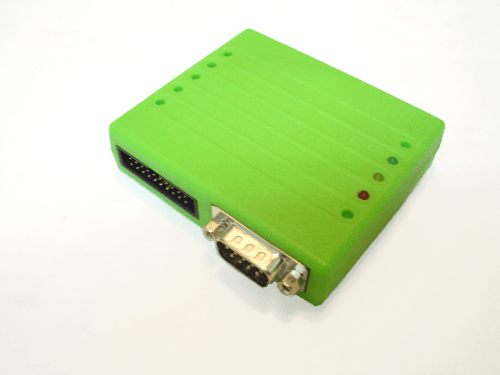 The serial port is completely independent from OpenOCD on both Linux and Windows. You can use the Flyswatter2’s serial port without having to use OpenOCD or JTAG, or you can use it together with OpenOCD and have both a serial port and JTAG interface operating at the same time for debugging and communicating with your target device. For Linux, the RS232 driver for the FT2232 is part of the main kernel tree and is provided in most standard Linux distributions. In Windows, you have to load the Windows driver for the FT2232. Once the driver is loaded, Windows will assign a virtual COM port to the Flyswatter2’s serial port. It operates just like a standard COM port. You can use the Flyswatter2’s serial port on laptops or PC’s that do not have a 9-pin legacy serial connector. You can use Minicom to communicate with the Flyswatter2’s serial port on Linux. See the Minicom page for setup instructions. This guide walk a first time user through connecting the Flyswatter2 to the BeagleBone Black Board, and installing and running OpenOCD and GDB Debugger. 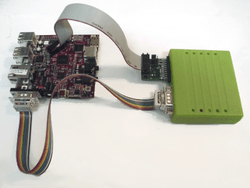 These guides walk a first time user through connecting the Flyswatter2 to the Olimex LPC-P2148 Prototype Board, and installing and running OpenOCD and GDB Debugger. 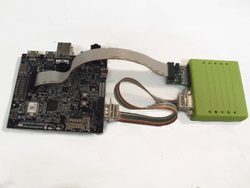 These guides walk a first time user through connecting the Flyswatter2 to the Olimex PIC-P32MX board, and installing and running OpenOCD and GDB Debugger. These guides provide a first time user with instructions for the Beagleboard, and installing and running OpenOCD and GDB Debugger. These guides provide a first time user with instructions for the TI Beagleboard XM, and installing and running OpenOCD and GDB Debugger. These guides provide a first time user with instructions for the TI Pandaboard, and installing and running OpenOCD and GDB Debugger. These guides walk a first time user through connecting the Flyswatter2 to the Ubiquiti RouterStation Pro, and installing and running OpenOCD and GDB Debugger. These guides walk a first time user through connecting the Flyswatter2 to the MikroElektronika LPC2214 mikroBoard, and installing and running OpenOCD, GDB Debugger and Eclipse.